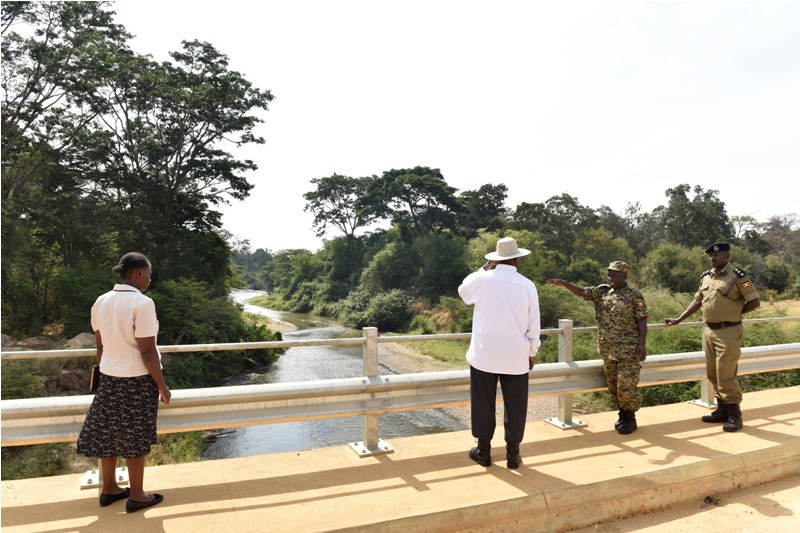 President Museveni has said those cultivating in swamps and planting eucalyptus trees must vacate in order to end drought and associated disasters. He said people have destroyed the environment under his watch because he is patient, adding that guarding the environment requires concerted effort. “I appealed to the people to leave wetlands and they refused. Now God has given us a punishment – prolonged drought. I am told this drought has been here for the last three years,” he said. President Museveni compared himself to Pontius Pilate who surrendered innocent blood to please the people. “If Pilate had stood his ground and refused to surrender innocent blood, may be Jesus would not have died,” he said. While appealing to people to heed the advise so as to avoid consequences, the President cited Banyankore/Bakiga proverb that says that when a wild animal refuses to heed the warnings of a hunter, it becomes roasted meat. He said people have done well in fulfilling God’s wish of producing and filling the earth but have disobeyed God by destroying wetlands and turning them into gardens. “If you come to my village, you would not find that I have encroached on God’s creation of wetland. That is why God blesses me,” the President said. 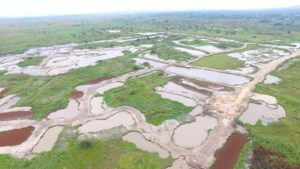 “Scientists say that 40 percent of the rainfall we receive comes from the wetlands and swamps, lakes and forests of Uganda. Sixty percent of the rainfall is made by the large oceans like the pacific or Indian Oceans. Now to destroy our swamps means we are depriving ourselves 40 percent of our potential to create rainfall,” he added. “The Bible says that what one sows is what one will reap. We are reaping what we sowed. The good side is that our God is a forgiving God. If God had not taken me into politics, I would probably have become a Bishop,” he said. The President donated relief items, including 550,100 bags of maize flour, 1,000 bags of rice and 100 bags of beans to hunger-stricken Kanungu residents. “I have come with my daughter called Nakyobe who works in my office. I want you to show her the place down the valley on this river where she will establish a solar powered irrigation scheme. She will send technicians to the district chairperson Katsya. I have been to the river valley down there, you know I am a guerilla fighter. I first survey,” the President said. 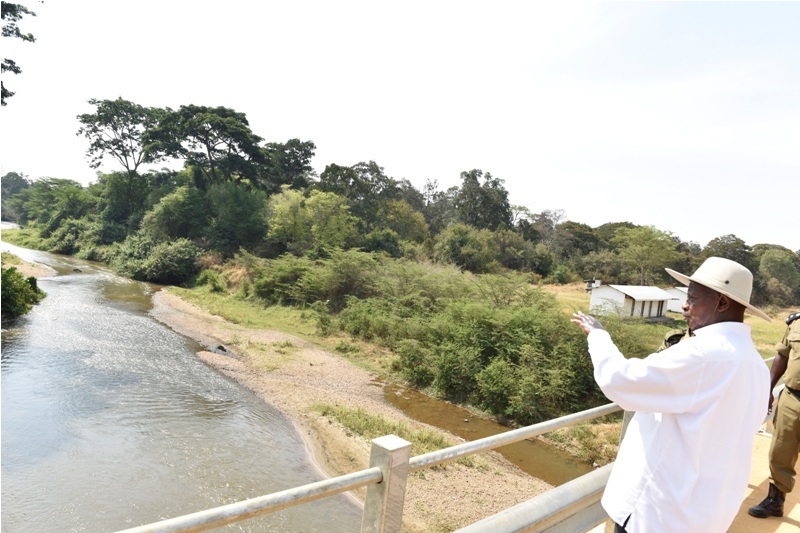 President Museveni inspects a river in Kanungu District. “I have also brought seeds for quick maturing high yielding crops. These include pumpkins, beans, sorghum, millet, maize, cassava, Irish potatoes and dodo which is multipurpose–used by both human beings, animals and birds,” the President added. He urged people to embrace the rudimentary irrigation method that he has employed in his gardens in Luweero and in Busoga where he does the irrigation by himself. He lauded religious leaders for assisting government in this effort of relief supplies to the hungry people. The President’s visit to the southwestern district of Kanungu comes days after Opposition nemesis Dr Kizza Besigye visited the area earlier this week. Besigye was chief guest at a fundraising ceremony at Nyabihoko Catholic Church in Kyajura village, Nyamigoye parish, Kanyantoro sub-county in Kanungu District. He said people in Kanungu wouldn’t be dying of hunger if government that has been in power for more than 30 years, was committed to preventing the situation. “People in desert countries such as Egypt use the water that originates from Uganda to produce enough food,” said Dr Besigye. Kanungu District is home to former prime minister John Patrick Amama Mbabazi.